The Need – To achieve widespread increase in resources at the moment of an incident, at the neighborhood level, to enhance individual disaster preparation, response, recovery. To provide a support infrastructure for individuals between the time of a disaster and the availability of broad community resources. The Opportunity – The emergence of a unique resource in comprehensive community strategic planning, “Regional Clergy Engagement” providing for the nation’s first systemic structure to engage all clergy in a region. The pilot projects, stemming from “Regional Clergy Engagement,” have assembled an array of components and methodologies including a county-wide database of the 350 clergy, mapping for congregations on a city by city basis, an infrastructure of communication among clergy and with civic leaders, regionally and by city. These tools are available to enlist the clergy and the congregations they represent in a planned process to increase the number of prepared households and to provide response centers at the time of a disaster. The structure of the Regional Clergy Engagement (RCE) has been developed with the intent of providing a model, and components of the model as applied to specific projects, which can be duplicated in other counties. The Framework – The incorporation of congregations as a neighborhood resource for sites, personnel and coordination, so that congregations become the “neighborhood institution” to foster greater preparation, support of immediate response, and coordination of assistance for at risk individuals and unexpected circumstances. Geographic division into clusters within a city and designation of all congregations in each cluster as a Core Congregation or Support Congregation. Designation of an Agency Representative Team and a Congregational Representative Team, to include representatives from each congregation, fire, law enforcement, Office of Emergency Services, Red Cross, human service agencies and business. A designed process based on the Congregational Certificate and Tracking System, to increase the number of prepared homes in the cluster neighborhoods through the coordination of multi-congregational initiatives. Formation of system for the pre-designed neighborhood response centers and shelters based in core congregations. Providing Trainings in Multi-Faith Awareness for the staff of all institutions engaging in emergency management responses, to ensure core understanding of the religion beliefs and practices of the diversity of (a) faith institutions to recruit partners, and, (b) all individuals to serve victims of disasters. Goal – A transformation in the structure of preparation, response, recovery. To increase, prior to a disaster, the number of prepared individuals and the modes of mutual support. To give individuals seamless support in the initial phase of any incident and continued support as local/regional/state and national government and emergency response agencies phase in services to cluster areas. In August 2005, immediately prior to Hurricane Katrina, The Peninsula Community Foundation had initiated the San Mateo County based national pilot which successfully designed the structure for “Regional Clergy Engagement” (RCE). 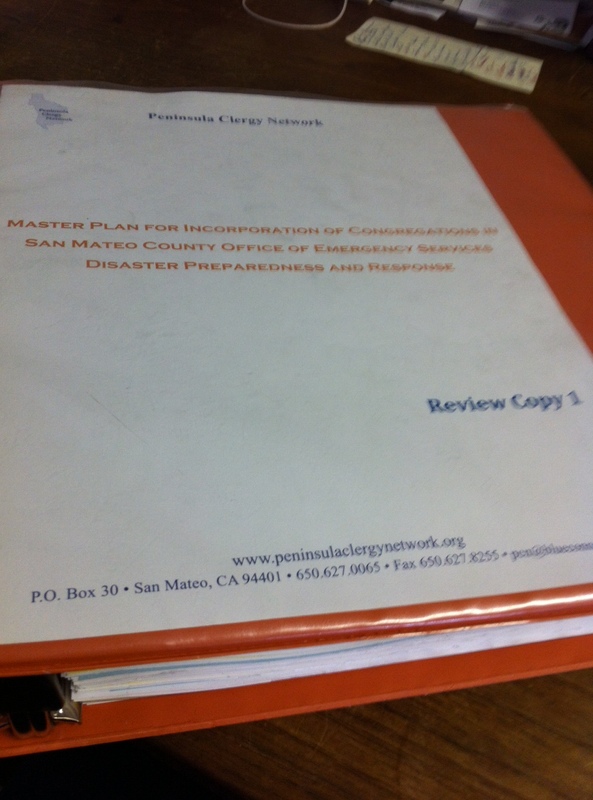 The day following Katrina, San Mateo County officials requested the participation of the “Regional Clergy Engagement” staff with Office of Emergency Services (OES) staff to develop a plan for the coordination of resources between the Office of Emergency Services and all congregations throughout the county. The goal of such a plan would be a system which could provide for enhanced emergency preparedness, response and recovery, in order to fill the gap now identified for an individual to be without emergency responders beginning in the first minutes of a disaster and for subsequent days, even weeks. The proposed plan, outlined above, for congregation design for Disaster Preparedness, Response, Recovery (DPRR), was completed by February, 2006. The plan received funding for a pilot at the city level from the Sequoia Healthcare District (May, 2007 – May, 2010). This city pilot resulted in the (a) formation of the key components and methodology for the plan, (b) development of test clusters of core and support congregations, and (c) coordination of the nation’s first “Neighborhood Disaster Drill” (NDD). Project Binder: Cover and Table of Contents. Following the city based pilot, two sessions were convened of an expanded County-Wide Pilot Agency Representative Team to structure a strategy for a county-wide pilot. 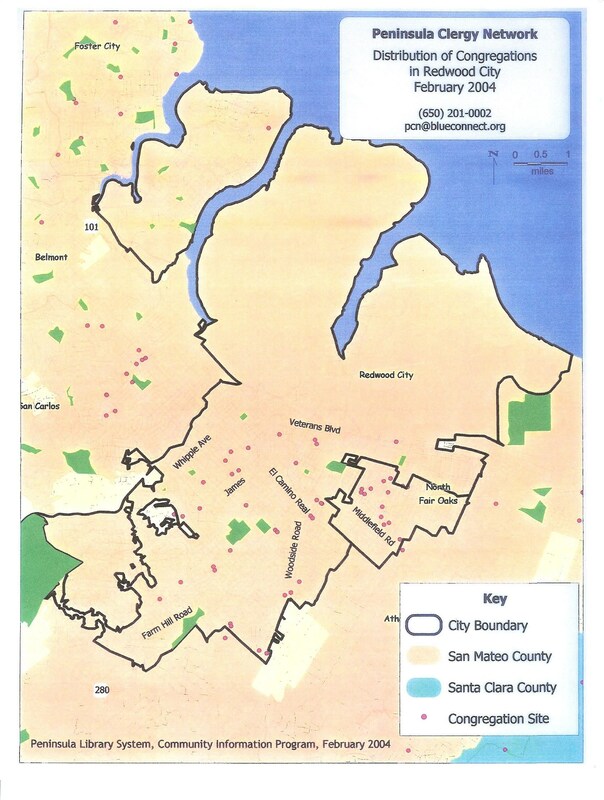 Pending funding support for a county-wide pilot, San Mateo County funded a transition phase to sustain the plan development and formation of the key components and methodology. This funding served two purposes: (1) Maintaining active engagement in advancing the concept and plan, and (2) partnership with agencies in San Mateo County to further develop specific components and methodology. The North County Fire Authority was designated as the agency for this transition phase. This was beneficial because it provided for the extension from a single-city pilot to a multi-city pilot. This transition phase had the significant value of confirming the application of existing components and methodology (see above), extending outcomes of the plan and establishing unanticipated additional capacities within the plan. Further confirmation that the structure for county-wide “Regional Clergy Engagement” provides the previously unavailable capacity for the design of a comprehensive plan serving each county, Office of Emergency Services, and the associated city emergency management agencies. Each county can devise DPRR plans which are “city based projects”, or depending on city size, a “small cities shared project” or a “large city sub-area project.” All of these plans support congregation coordinated functions as coordinated by emergency management agencies, at all points in preparedness, response and recovery. (a) Coordination utilizing cluster core and support congregations. (b) Primary (congregation based) and secondary (neighborhood resourced) recruitment, training, retention and coordination of personnel for incident response. (c) Instant, pre-assigned, neighborhood based site utilization of geographically designed professionals in health, mental health, etc., responding from work sites, or from home on nights and weekends. (d) Alignment of all congregations with dual capacity for each cluster to provide both “IncidentIN” and “IncidentOUT” functions (see below: Lessons – Rockaways – “Shifting”). (e) Protocols for congregations in effective coordination of spontaneous donations of people and materials. This is currently lacking from FEMA and regional disaster donation coordination protocols. San Bruno Gasoline Explosion: Rabbi Jay Miller, whose experience included serving as the “Regional Clergy Engagement” lead staff and the Congregation DPRR Project Director, was called to respond on-site at the time of the explosion and maintained a coordinating role through the first night and long segments of the next five days. He provided coordination of clergy and congregation related support for the county OES and the city staff directed Emergency Operation Center (EOC), as well as the onsite Red Cross shelter coordinator. Based on this background, Rabbi Miller was able to observe situations as they evolved and access (1) prior outcomes which had lacked a coordinator and (2) current outcomes when managed by a specialized coordinator. Rockaways – Hurricane Sandy: Rabbi Miller conducted on-site interviews in the Rockaways and Brooklyn with participants who shared in response (a) from individuals who were part of the Occupy Movement who mobilized as “Occupy Sandy” the morning of the hurricane and (b) the clergy and congregants from congregations in the Rockaways and Brooklyn, who activated their congregations the morning of the hurricane. In the city-based pilot of the plan, each step was sequential, confirming components and methodology and providing the basics for the next step. The transition phase served to conclude the sequential nature of the process thus far. The application of components and methodology to a second geographic and a multi-city area provided the substantive confirmation that the “package” achieves the initial goal of the coordination of assets provided by the congregations within OES and city emergency management agencies. In the initial development of the plan, there were three targeted support levels of implementation: (A) Resource Coordination, (B) Resource Management, (C) Coordinated Incident Operations. In the 2008 overview, Level A was considered achieved, level B in process, and level C remained a target. As a result of this transition grant, the components and methodology of all three levels are more fully in place. Reconvening the county-wide expanded Agency Representative Team, with the addition of regional, state and federal emergency management agency representatives. Congregants’ experience of the “real” thing in their space as a motivation for personal heightened seriousness regarding personal and neighbor based disaster preparedness by the individual, their extended family and their spheres of influence. Utilization of the clusters in this phase to achieve additional congregation coordinated community benefits using “Regional Clergy Engagement” Project pilots and models in conjunction with community partners. Assessment of the scope of benefits provided by geographic cluster formation by street blocks, and the innovation of the neighborhood “crew” on each street, to support individuals in specific demographic groups in (a) the initial three hours of disaster incidents, and (b) pre-incident general resilience. (Sample groups: Seniors, single parent families, health impacted individuals, economic impacted individuals, individuals at risk of acts of child abuse or domestic violence).